A national bestselling author delivers a heart-pounding narrative, taking readers inside one family's struggle to cope with loss, while at the same time searching for a team of killers. 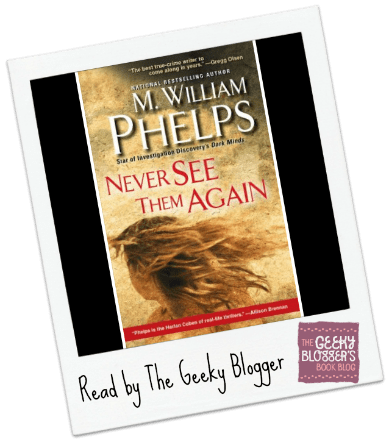 First Thought when Finished: Never See Them Again is a book I picked up after watching The Forensic Files on the case. I wanted to know more. Quick Thoughts:Overall this was a good delve into the murders: a little more detail into the motive and the investigation surrounding the case. A lot more information than was in the show that I watche so I got more background on both the victims, perps, families, and cops. I thought it spent a little too much time in the beginning focusing on the lifestyles of the victims –especially knowing who the perps were but that was a decision the author made. True Crime is not always a compelling read but this one wasn’t bad. It did flow well and gave the fill-in information I was looking for. Forensic Files is addictive. Although I can’t binge watch the reruns, gives me the chills! It is always fascinating to learn more about investigating and hunting down criminals. I read a book last year that talked about DNA findings. Black Eyed Susans. I think you would like it. I used to read a lot of True Crime when I was a teenager, but mostly quit because a lot of authors focus on the brutal details and not so much on the investigation or trial. Ann Rule was the only True Crime author I’ve continued to read, but sadly she passed away recently. She was a huge voice for victims and survivors advocacy. I still watch all the Forensic Files, Women Who Kill, Snapped and Dr. G that I can, but I can’t watch the ones where the killers go uncaught. Off to go research this crime to see if I’ve heard of it yet!